Our children’s director is responsible for scouring the universe looking for potential children’s curriculum. It’s a tough job. Some believe the really sound theological stuff is boring and the really creative stuff is doctrinally shallow. If generally true then those of us who can’t write our own curriculum have one of two choices: we can either get sound stuff and make it creative or get creative stuff and make it sound. From what I understand, creativity demands time and resources that even large church church ministries don’t necessarily possess. Some argue there is gospel-centered children’s curriculum that is creative, but from what I have heard (and seen) this is a rarity. Also, some complain that in order to get certain gospel-centered, creative materials the church must make a long-term commitment to one curriculum (a commitment that might go against the curriculum strategy of some children’s ministries). For CCCC, we have determined to find creative curriculum that we will devote time shaping into more gospel-centered material. Our Children’s Director created a Curriculum Team (CT) whose sole job is to evaluate the curriculum she has gathered for consideration for use in the next six-month period of time. This brings the evaluative process in the hands of more than one person. Frankly, it allows our Children’s Director to go after a greater amount of material knowing that the CT will thoroughly evaluate the stuff she discovers. In addition to discovering the strengths and weaknesses of material concerning its use for CCCC’s needs (e.g., creativity, small group/large group breakdown, etc. ), the team looks at the gospel-centrality of each lesson. They make notes, talk about it as a team, and make recommendations back to our Children’s Director. The Children’s Director will then submit that six months of curriculum to the CCCC elders responsible for theological/doctrinal soundness. She also will submit the same material to the Spiritual Formation Team (SFT) which oversees the general spiritual formation of CCCC. 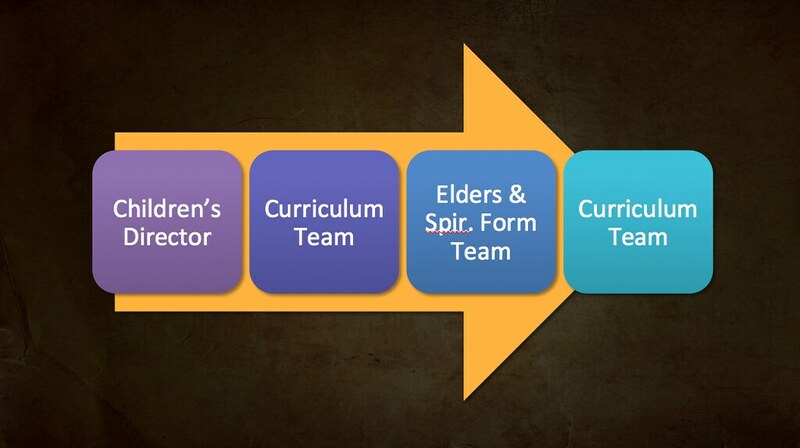 The elders and SFT will make notes (think two highlighters) and suggest resources to help the CT better address certain problems they have raised about specific sections of the curricula in their Step Two evaluations. After a couple of weeks, our Children’s Director will meet with the SFT for any questions or feedback about the potential curricula. She walks them through each set of lessons, noting their individual emphases and how they help “move the ball down the field” toward our learning objectives for the age-graded ministries. This is a wonderful time for many reasons, not the least of which is that the church leadership feels fully informed not only about what our kids will be learning but how each set of curriculum points to the gospel. The CT is then given the approved materials to then further breakdown, edit, and process in order to make it useful for CCCC Children’s ministries. As you can see, the pathway allows many different groups of people to get their hands and eyes on potential children’s curriculum. Knowing that any materials will have a teams of people that will both evaluate and edit materials for gospel-ends also allows CCCC to widen the bandwidth on the amount of curricula to be considered. While some curriculum is rejected because it would take too much editing to make it useable, we embrace other curriculum that some might reject because we will edit it for gospel-centrality. Next post will look at the third step in CCCC’s filtered process.